Ever Feel Overwhelmed?! Here's a Great Solution! 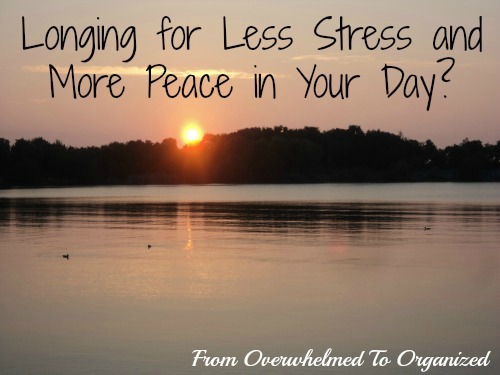 | From Overwhelmed to Organized: Ever Feel Overwhelmed?! Here's a Great Solution! I've always been a night owl, but my hubby's work schedule has been so varied lately and I've been very tired from our busy schedules, so I've had to go to bed earlier and wake up earlier to manage everything. I'm not the best in the morning, but I'm working on it. I know I handle the day better when I get my morning off to a good start, but I need to work out what that looks like. 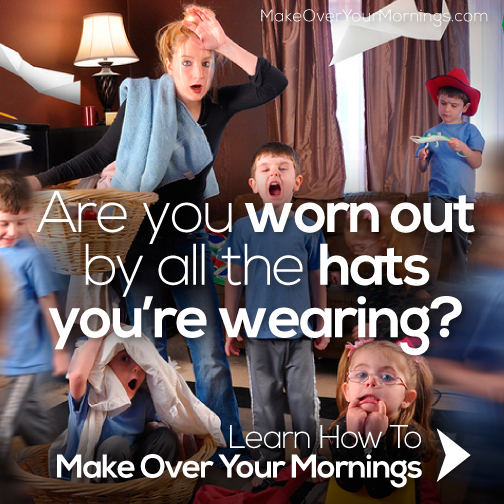 So I was really excited when I heard about the Make Over Your Mornings course! It just launched today but I had a chance to preview it over the last few days and I can already see what a difference it's making. A tiny investment -- just 15 minutes of your day – can yield potentially amazing results for yourself and your family. For today only, you can get this course at amazing rock-bottom prices! 7 am - 12 noon (ET) - just $7! 12 noon - 5 pm (ET) - only $10! 5 pm - 12 midnight (ET) - only $13! After that the regular price will be $17, which is still a great price for a course that can help eliminate so much stress from your life. Also, today only, June 2, Crystal is donating 25% of all sales to South Africa where they will be used to build a 2-classroom facility and 2 Enviro-Loo toilets at the Reagoboka Centre! Read more about that here. Have you yearned to get into a morning routine that begins with time to fill your soul before the rest of the household needs you? If you have wondered how others seem to find 36 hours within a 24-hour period, then this course for you! 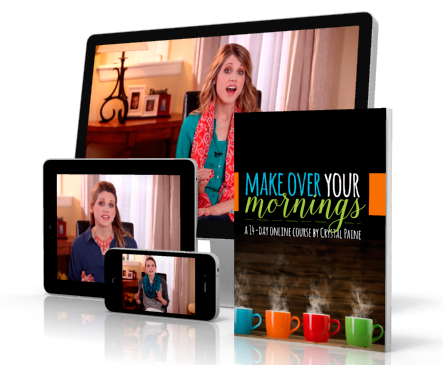 Crystal has designed the Make Over Your Morning course around the tried-and-true habits that she has used as part of her own morning routine FOR YEARS. But don’t mistakenly think this course will teach you how to have a morning the mirror-image of Crystal’s! Because every single woman’s life and roles are unique to her, this course is not a one-size-fits all! Rather, Crystal walks you through these principles and tools and shows you how to apply them to YOUR life, YOUR situation, YOUR family, so that you can make over YOUR morning. Are you are interested in jumping off the hamster wheel of exhaustion and eliminating the defeating sensation that there’s never enough time for the important things in life? 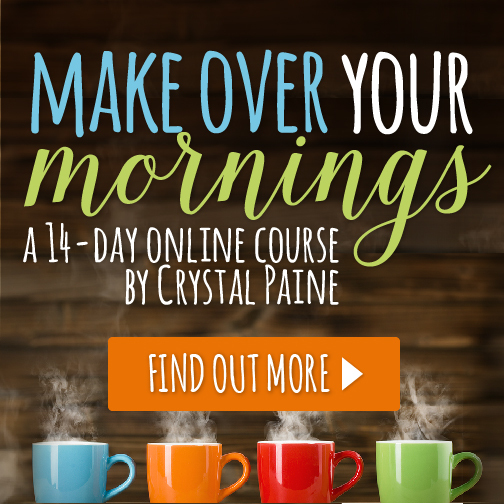 If you are, then join me in taking Crystal Paine’s brand-new 14-day Make Over Your Mornings course. Disclosure: This post contains affiliate links, which means if you purchase this course after clicking one of my links I will receive a percentage of the sale. This helps cover the expenses associated with this blog. I only promote resources that I fully believe will help you go from overwhelmed to organized and all opinions expressed in this post are 100% my own. Thank you for supporting this blog! What are you most looking forward to experiencing when you make over your mornings? Sounds like it has some good ideas in it!